I glanced up to see our Japanese roommate. Because of a fortuitous twist in the staircase and because we were the sole occupants of the upstairs unit, Barret and I were used to privacy. It was completely unexpected to hear someone thump thump thumping up our stairs; she was lucky she only caught me in pajamas and a freshly washed face. “Uh… yeah.” I wasn’t sure where her question was going. I also couldn’t remember her name, I hardly ever saw her. As if to authenticate her claim, her fingers grazed the maroon bumps on her forearms before settling down to scratch them. She asked if I was itchy. I did suddenly feel itchy but I said no as if saying it forcefully enough would save me from the same ravaged ankles and forearms. I definitely didn’t want whatever she had to migrate upstairs. “Ok.” Our roommate was already hurrying downstairs to warn others. Turns out, the bug bomb dropped at an auspicious time. As soon we stepped outside we were greeted by a beautiful sunny day, literally. 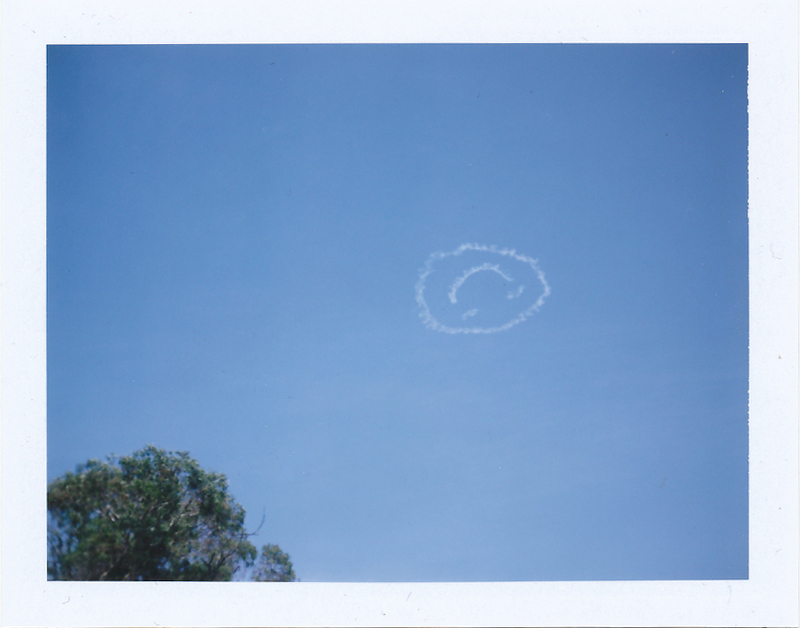 There was a smiley face in the sky. We walked down Glebe Point Road, the heart of Glebe, and stopped in at Wedge Espresso for brunch. It was a narrow café, wide enough for three people to theoretically sit next to each other. Since Barret and I sat along the counter overlooking the sidewalk, our waiter walked outside the café to deliver our salad and toast & eggs. He was a friendly young Aussie who wore both overalls and two dark hickies with stylish aplomb. He was interested in our Polaroid camera, so we showed him the photo we had just taken of the sky. When we paid our bill, he shook our hands and invited us back like old friends. We had only been gone about an hour, so we spent the rest of the afternoon looking for a Secret Santa present. The only thing I knew about my coworker was that she didn’t like chocolate or anything else I covertly mentioned at work. After scouring the local book and vintage stores we ended up at the Broadway Shopping Centre, the mall at the end of the road. Barret liked a ring-shaped ice cube tray, I thought it was too risky- she could have just broken up. Barret liked the gift set from Target, I thought it looked too cheap. He also liked the Jamie Oliver recipe box, but I was like who even uses recipe cards anymore? Then Barret chose a heart-shaped box made from rolled newspaper, which I vetoed. My Secret Santa didn’t have any soft spots (btw I found out later her favorite food is meat, I think that proves my point). I was beginning to suspect that Barret liked anything that would get us out of the mall faster. Just before the Christmas crowds in Trade Aid engulfed us, I decided on a set of organic tea. By that time we had been gone for several hours and we figured our home was ventilated enough. Barret, of course, liked that idea. I found myself wishing that this particular article was several pages longer. Very enjoyable!